What do you know about virtualization? There is a quick 12 question quiz at Computer World. Go on, you know you want to give it a go. Here is my score. Yes, 100%. Much better than the just pass that I got on my prometric exam this morning, but that was not about virtualisation. A hint, don't answer what you think, answer what you think they want you to think. Can't say I agree with the answers, but its not to hard to pick the ones they want. James Urquhart over at cnet in the Wisdom of Clouds blog has an interesting post about "A maturity model for cloud computing". Consolidation is achieved as data centers discover ways to reduce redundancy and wasted space and equipment by measured planning of both architecture (including facilities allocation and design) and process. Abstraction occurs when data centers decouple the workloads and payloads of their data center infrastructure from the physical infrastructure itself, and manage to the abstraction instead of the infrastructure. Automation comes into play when data centers systematically remove manual labor requirements for run time operation of the data center. Utility is the stage at which data centers introduce the concepts of self-service and metering. Market is achieved when utilities can be brought together over over the Internet to create an open competitive marketplace for IT capabilities (an "Inter-cloud", so to speak). James then goes on to detail out what organisations are doing in these area, where the opportunities lay, which is all good. So what does this have to do with all those VMware customers out there? Why is this more important than a new name like vSphere? Well what struck me about this is how it sits with what I have been thinking about as important for 2009. 2009 is going, in my humble opinion, to be the year of automation for VMware/vSphere environments. If there is one thing thats worth investing in, its the automation areas of your virtual infrastructure. Automation is often not tackled up front in the VMware lifecycle and it requires a certain level of maturation of virtualisation within the orgnaisation first. Why automation? Many sites have started on the path of consolidation and abstraction, sure there is more to do in these areas, but this will be organic growth on the existing base. The industry/vendors will be running around releasing new versions, pushing clouds and all sorts of great things. Yet if you don't have your automation right these new paradigms may be difficult for you to adopt in late 2009 or early 2010. Automation takes time and investment, it will not occur overnight in your organisation. How can you package your application system into a vApp and describe is service characteristics if the only way to create that systems is days of manual installation and configuration? Automation will also give good returns. In tight economic times automation can reduce TCO. Many of todays security risks and downtimes are caused by human error, not failing hardware, the more that can be automated, the more those up times can be increased. Take a look at what VMware have done this year. They have released Site Recovery Manager, Stage Manager and Life Cycle Manager. They have new initiatives within the systems and life cycle management market with companies such as BMC, CA and HP. In 2009 we should see the release of the technology from the B-hive acquisition. It certainly looks like VMware themselves have been getting ready and we may see maturity and greater adoption of these offerings in 2009. Do you see automation as a key initative for 2009? Leave your views in the comments section. Unless you have spent the last 48 hours entrapped in a shopping center doing last minute Christmas shopping you will have seen that the new name for the next version of VMware has been officially leaked. vSphere it is. I say officially leaked because no one was game to spill the beans until someone with enough authority gave the okay. The name was mentioned at a user group meeting last week and wanting to report on it Jason Boche got authority from VMware marketing to say it in a wider forum. You do wonder if this is was a plan by VMware? Seems strange to have the big name change for your key product launched via a user group and the blog sphere. Are they just following the hype that Veeam are getting with the release of their new free product, I doubt it? Did they feel that it was going to get out anyway so might as well be part of it, maybe. Lets see how long it takes for the official press release to appear. At the end of the day its just a name (sorry Marketing). This new version has been called many things, starting out with K/L. At VMworld you would hear lots of VMware employees use the phrase "K/L" and the Beta forum is labeled "K/L". Of course most people have been calling it VI4. It will be interesting to see how this name integrates into all the other recent name chnanges, VDC-OS et al. Things could be worse, can you imagine what it was like for all of those die hard Citrix fans. One day your company buys this thing called Xen and then after a few months they rename just about every product in your sweet by putting Xen in the front of it. Now that has to put the whole vSphere name into perspective. It could have been EMCompute or something. Although I think Sean Clark gets the prize for Atmos-vSphere because EMC have Atmos, their cloud optimized storage. Atmos-vSphere, it has a certain ring to it don't you think. 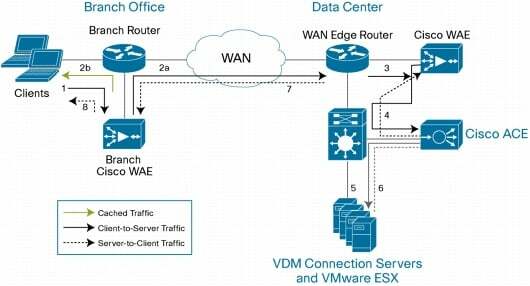 On Tuesday I posted about VDI and WAAS, as part of an ongoing discussion on WAN optimisation for VDI. Today I finally got some deeper detail from Cisco about VDI and WAAS, shout out to Brad for putting me onto it. The document is the "Cisco Application Networking Services for VMware Virtual Desktop Infrastructure Deployment Guide" and it is well worth your time to have a flick through. If you are looking at putting in WAN acceleration for VDI/RDP then you should read through this document, no matter what vendor you are looking at, to give you some good detail. For example it details traffic flows, configuration details and performance results. The response time measured at the remote branch office during a test of 15 simultaneous VMware VDI sessions shows a 4-times improvement. 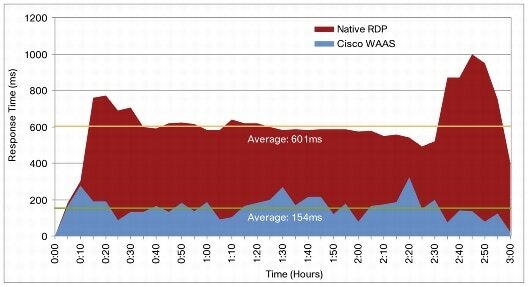 Cisco WAAS acceleration results in an average response time of 154 ms, and native VMware VDI achieves an average response time of 601 ms (Figure 18). If our metric for user experience is under 200ms this shows that without WAAS we have a problem, with WAAS we have success. Go have a read for yourself, its worth the time. New documents added to the "VMware Technical Resource documents listing" on VMTN. At version 17 there are now 198 documents listed with abstracts for searching. This reference architecture kit is comprised of four distinct papers written by VMware and our supporting partners to serve as a guide to assist in the early phases of planning, design and deployment of VMware View based solutions. The building block approach uses common components to minimize support costs and deployment risks during the planning of VMware View based deployments. Have you wondered why its the end of the year and you are just exhausted? Maybe its because for the last 12 months you have been trying to keep up with the frantic pace that is the virtualisation world form a VMware perspective. Here is a brief recap of what you had to digest and manage this past year. Microsoft announces support for 31 applications running under a Server Virtualization Validation Program (SVVP) listed hypervisor. I am sure there are items I have missed, so post into the comments and I will update the list. Have a wonder Christmas and a happy new year. Rest up, 2009 is going to be even bigger! What would a Enterprise, in particular one using virtualisation, take away from a Cloud computing event? What if the speakers were from Cisco, Yahoo, Google, Microsoft, Baker & McKenzie and Deloitte Digital? Well two weeks ago I went to such an event, took lots of notes and engaged in some interesting discussions. Here is what some of what occurred and my updated thoughts on the Cloud space. This conference will kick start your Cloud strategy and will get you up to speed on what the main players, critics and users think about the potential of Cloud Computing. It will give you the opportunity to discuss your issues surrounding Cloud Computing with your peers and our expert panel of speakers. The speakers were local heavy hitters and an impressive list. Some of their presentations are available online and worth a look. The Google one was originally public but has been pulled at Google’s request. Of course the presentation from the legal firm was never public, go figure. Living on a Cloud: Gaining leverage without the costs, presented by Keith Marlow, Chief Architect, APAC Region, Yahoo! Thinking strategically about Cloud Computing , presented by Anna Liu, Group Manager - Emerging Technologies, Microsoft. Missing were the industry analyst types, such as IDC and Gartner and as a result there was not a lot of this is what the industry and market are doing. Instead what was presented was what the speakers form the organizations are thinking about in terms of direction in the cloud space. If you were to pick the vendors in the Cloud segment the only two vendors missing were Amazon (not much of a presence in Australia) and VMware. Amazon is fare enough, they don’t have much of an interest in Australia, however I think it would have been good to see VMware there, as I believe they have a lot to contribute to the space. What were the highlights then, as there is way too much to report on in detail in this forum and format? All of the vendors see a strong growth in the various forms of Cloud computing. To paraphrase Anna Liu from Microsoft, “You either embrace and anticipate these changes or get left behind”. For example Cisco are one of the biggest users of Salesforce.com, the NY times used Amazon and Hadoop to convert 4TB of images to text, in just 24 hours, Gmail has over 10 million paid accounts and Cisco now own Webex (a SaaS based app) and its in their list of top return on investment acquisitions. There was a reasonably common view of what cloud computing is and is not, yet each company had a particular slant to their area of the cloud (which you would expect). The breakdown was typically your SaaS, PaaS and IaaS. From the IaaS site Cisco were certainly the most strong as you would expect, although it was termed “hosting” which was a little strange. In terms of alignment with VMware Cisco was very close, even mentioning the recent visit my Paul Maritz and discussing hybrid cloud of on and off premise. Both Cisco and Yahoo spoke about virtualisation and the changing space of the server world. Keith Marlow from Yahoo! made the obvious but insightful comment that the overhead of virtualisation was a constant and due to the increasing power of processors this constant was becoming irrelevant. Keith showed a picture of the Yahoo! datacenter with 20,000 nodes. With all of that processing power sitting there, it makes economic sense to sell some of the capacity. Kevin Bloch from Cisco spent some time talking about virtualisation and increasing core counts and how this was changing the game in data centers. Cisco made a good observation that WAN acceleration technologies are going to be important as clouds are built and federated with more and more data flowing around. Of course WAAS was mentioned. Security was mentioned multiple times as issues being presented as a concern by the market place. Whilst everyone acknowledged and respected this, the responses were generally aligned. The view was that currently people trust their banking and credit cards to the Internet and forms of cloud, so we are already starting to see acceptance. Comparison was made to the level of skills, quantity of people and attention to the problem that the providers give compared to the usual very small set of security staff within an organization. (However as one college reminded my today, they have much larger attack surface to cover too). The concept of access from any where at any time from any device came up a number of times. This links in very well with the VMware vision for View and access to your desktops, applications and data from anywhere at any time. Openness was certainly a theme from Yahoo! and Google. Open APIs, or Open Standards, being able to embrace and extended were seen as important. Certainly the presentation from Microsoft was the best, from my view anyway. Anna was not only a good speaker but had some good insights into the space. I recommend flicking through the presentation and I would love to hear her speak again on the topic. Some great comments such as just because you have control of an SLA, that is, its in house, does not mean that the SLA is any better than it might be if you don’t control it, such as in the cloud. A good contrast was made between control and economies of scale. A car gives you lots of flexibility for transporting things anywhere you want but does not have as good economy of scale. A freight train has great economy of scale but comes with a constraint of controlling flexibility. This balance of control vs scale was compared to build vs buy and on premise vs in the cloud. The Microsoft way was to move to services from the cloud (SaaS) or rewrite applications (PaaS). Around PaaS the view is strongly aligned with .net and hence Azure. Anna indicated that moving is “non trivial” and that there is going to be on premise and cloud models for quite a while. Here is a picture of the Yahoo! room with 20,000 nodes. So if this conference was to help one understand and think move about the Cloud computing space, what influence did it have? Did it change or enhance my thinking on Cloud? In some ways yes, and I recognize that I too come at cloud from a very specific angle. Here is my current positioning. SaaS is going to be a massive market. However in the main this adoption is going to be more in growing new services that are tactical rather than the main game of organizations core business processes. Yes Cisco may move to Salesforce.com but for most enterprises core elements are going to stay in house. It’s the new systems and non core that are going to see the most growth in SaaS. When that project team needs a new intranet site, rather than waiting two weeks for IT to not deliver, they will put their credit card number into a website and be up and running in 10 minutes. PaaS is the challenging space. Microsoft is going to push .Net real hard, and that means Azure. The challenge for all of the players is to support open languages such as Hadoop and Ruby on Rails. This strategy is good for customers in the enterprise. If they develop their own applications in these open languages they can execute them internally on their own clouds. After all a key element of VDC-OS is running the workloads of today and tomorrow. With VDC-OS you can run mixes of work loads and change them on the fly, one day 10% of your cluster might be running Hadoop nodes and tomorrow, to scale up for a specific project work load, it may be 30%. Even better because you have written to an open standard you can go to a provider in the open market to buy capacity for short or medium term, if you really need to scale up. Even if you run that application out in the external cloud, if there is a problem, or for testing, or for DR, you can always run it in house on your own cloud if needed. VMware need to work hard here to not let the ISV market get away from them. Maybe that’s why Paul Maritz can’t stop saying Ruby on Rails. IaaS is VMware’s sweet spot. The enterprises know they need to move to the benefits that cloud and utility based computing can bring. They want to run like Google and Yahoo! The challenge is how to do this in today’s environment and that’s where VDC-OS, vCloud and vApp come into play. Running internal clouds, federating them, running the workloads of today and tomorrow, its not just a dream, its like Christmas, you know its coming and its not far away. The problem for VMware is to not been seen like Azure and be another closed shop. That’s why it’s good to see vApp being based on OVF. We know VMware is the best system for running workloads, if we can keep the portability of workloads it means the best technology wins. If it all goes closed, the best marketing company wins, and that is not VMware. Also VMware need to keep tight (like they already are) with complementing technologies. Networking is going to play a huge role in enablement of the cloud, from things like split VLANs to WAN acceleration. If you are in Australia and interested in cloud computing like I am. I would recommend you put March 25th, 2009 in your calendar. IDC are holding a Cloud Computing Conference on this day in Sydney. See, aren’t you glad that you read all the way to the end of this post! You can register for free as an early bird attendee. Also Richard Garsthagen in revealing details of VMWorld Europe 2009 has state that it will “probably” have a special pavilion for vCloud providers (2:20). If you have some thoughts on the Cloud space, leave a comment. Over at vinternals Stu asks if linked clones are the panacea that a lot of people are claiming about the storage problem with VDI? I say yes, however we are moving from designing for capacity to designing for performance, and VMware have given us some good tools to manage it. Let me explain a bit further. Stu essentially raises two issues. First, delta disks grow more than you think. Stu considers that growth is going to be a lot more than people expect, citing that NTFS typically writes to zero'd blocks before deleted ones and there is lots of activity on the system disk, even if you have done a reasonable job at locking it down. Second SCSI reservations. People are paranoid about SCSI reservations and avoid snapshot longevity as much as possible. With a datastore just full of delta disks that continually grow, are we setting up ourselves for an "epic fail"? These are good questions. I think what this highlights is that the with Composer the focus for storage for VDI has shifted from an issue of capacity management to performance management. Where before we were concerned with how to deliver a couple of TB of data now we are concerned with how to deliver a few hundred GB of data at a suitable rate. In regards to the delta disk growth issue. Yes, these disks are going to grow, however this is why we have the automated desktop refresh to take the machine back to the clean delta disk. The refresh can be performed on demand, as a timed event or when the delta disk reaches a certain size. What this means it that the problem can be easily managed and designed for. We can plan for storage over commit and set the pools up to manage themselves. To me the big storage problem we had was preparing for the worse case scenario. Every desktop would consume either 10G or 20G even though most only consumed much less than 10GB. Why? Just in case! Just in case one or two machines do lots of activity and because we had NO easy means of resizing them we also had to be conservative about the starting point. With Composer we can start with a 10GB image but only allocate used space. If we install new applications and decide we really do need the capacity to grow to 12GB, we can create a new master and perform a recomposition of the machines. Now we are no long building for worse case but managing for used space only. This is a significant shift. So happens today there was a blog posting about Project Minty Fresh. This installation has a problem with maintaining the integrity of their desktops. As a result they are putting a policy in place to refresh the OS every 5 days. This will not only maintain their SOE integrity but also keep their storage overcommit it check. In regards to SCSI reservations. I do believe that the delta disks do still grow at 16MB and not some larger size. So when the delta disks are growing there will be reservations, and you will have many on the one datastore. Is this a problem? I think not. In the VMware world we have always been concerned about SCSI reservations because of server work loads. For server work loads we want to ensure fast and more importantly predictable performance. If we have lots of snapshots that SQL database system which usually runs fine now starts to behave a little differently. Predictability or consistency in performance is sometimes more important than the actual speed. My estimation is that desktop workloads are going to be quiet different. In our favor we have concurrency and users. All those users and going to have a lower concurrency of activity, given the right balance we should have a manageable amount of SCSI reservations, if not we rebalance our datastores, same space, just more LUNs. Also unlike servers, will users be able to perceive any SCSI reservation hits as they go about their activity. Given the nature of users work profile and that any large IOs should be redirected not into the OS disk but into their network shares or user drives the problem may not be as relevant as we may expect. What Stu did not mention and we do need to be careful of because it can be the elephant in the room is IO storms. This is where we really do have some potential risk. If a particular activity causes a high currency of IO activity things could get very interesting. Lastly, as Stu points out, statelessness is the goal for VDI deployments. Using application virtualisation, locking down the OS to a suitable level and redirecting file activity to appropriate user or networked storage is going to make a big impact on the IO profile. These are activities we want to undertake in any event, so the effort has multiple benefits. I too believe you need to try this out in your environment, not just for the storage requirements, but also for the CPU, user experience, device capabilities and operational changes. VDI has come a long way with this release and I do strongly believe it will enable impactful storage savings. What I really want is the offline feature to become supported rather than just being experimental. Plus I want it to support the Composer based pools. There is no reason why it can't and until then, there is still some way to go before we can address the breadth of use cases. However there are plenty of use cases now, which form the bulk, to sink our teeth into. Two new documents added to the "VMware Technical Resource documents listing" on VMTN. At version 16 there are now 197 documents listed with abstracts for searching. VMware have released a new searchable HCL system that makes it much easier to check for compatibility. What does it look like and how do you use it? Read on. and the following image is an example search. What do we have here? Lets say you have a BOM for a system, it includes a new card you are not familiar with, a NC360T. Enter that into the keyword search on the IOs tab. Great news, its supported in just about all versions, any they are all listed in front of you, could not be easier! The page comes back with a number of components in the results. The first is a categorization based on partners. Lets say you type in something generic, this lets you quickly filter down to a particular vendor or subset, excellent feature. For the results many of the details are hyperlinks. I have shown an exploded view of what it looks like when you click on a element. The opening page shows the specific details of that item. This is a great new feature and is going to make our job so much easier. Do you self a favor and go and have a play with it, then create a bookmark! Do you think that VMware have too many locations of important or relevant technical materials? Its starting to feel there are a lot of places where some good content has the potential to be isolated or fragmented. Here are some of the places that I know of just off the top of my head which contains content. VMTN. Here you will find community documents but some VMware teams put their content here too, such as the performance group. VMware.com Resources - Technical Resources page. This page lists all of the technical papers, probably the most valuable resource. VMworld Community. This is a new space and vendor and VMware information is starting to appear scattered throughout. VMware Whitepapers page. More general white papers, and this does link to the Technical Resources list. VI:OPS. the Virtual Infrastructure Operations site. Knowledge base. Certainly a specific type of content thats going to be seperate. There are most likely others and I know there are some more on the way. I am sure there is an argument that each of these is targeted to a particular audience and its great to see VMware using the comminity to expand and enhance IP in multiple ways. However it does feel like things are starting to get fragmented and there is certainly a lot to keep your eye on if you want to be on top of the space. I wonder if VMware have a strategy here or are we seeing simply seeing Web 2.0 at work?